UPDATE 2 5 Jan 2018 14:00 UT: The launch has yet again been postponed by one day, to January 8th (January 7 local time) and I have partly rewritten this post to reflect this. UPDATE 3 11 Jan 20:00 UT: a follow-up post reflecting my changed thinking on what Zuma could be now we know it targetted a ~900-1000 km orbit, is here. If it isn't delayed even further, SpaceX will finally launch the secretive classified ZUMA satellite for the US Government on January 8th (January 7th local time in the USA) from Cape Canaveral pad 40 in Florida. The launch already has slipped three days from the initial January 5 aim. The satellite was originally to be launched last November (see an earlier post) from Kennedy Space Center pad 39A but was postponed because of issues with the payload fairing. The launch hazard zones and the Falcon 9 upper stage de-orbit zone as gleaned from the Maritime Broadcast Warnings are virtually the same as in November, as was to be expected (there is a very small lateral shift in the launch hazard zone, which is probably related to the change in launch pad, but the direction of the area is the same). They are depicted on the map above. The launch window runs from 1:00 UT to 3:30 UT (January 8th). The de-orbit of the Falcon 9 Upper stage happens some 2 hours after launch over the southern Indian Ocean north of Kerguelen, halfway during the 2nd orbital revolution. Back in November there was some speculation that ZUMA might target the ISS orbital plane, just like the odd classified satellite USA 276 appears to have done last year (see my article in The Space Review of July 2017). Another option is that it targets the plane of USA 276. 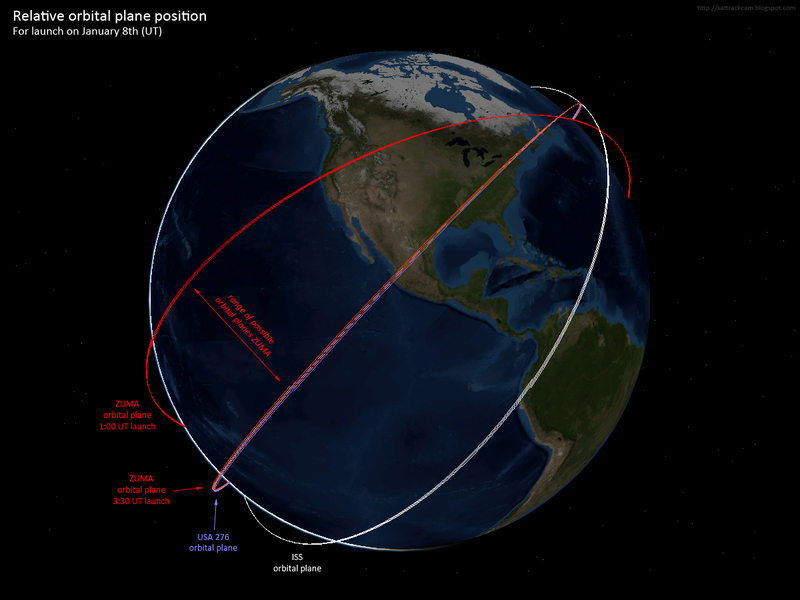 For the initial launch date and window in November 2017, the orbital plane of USA 276 would have passed over the launch site during the launch window, allowing a launch into the same orbital plane. After several days delay of the launch, the launch was postponed to January after the USA 276 orbital plane moved out of the launch window. The new launch window for January 8th is the same as it was in November: 1:00 UT to 3:30 UT. This excludes a launch (exactly) into either the ISS or USA 276 orbital planes, as the latter only pass over the Florida launch site after the launch window has ended. 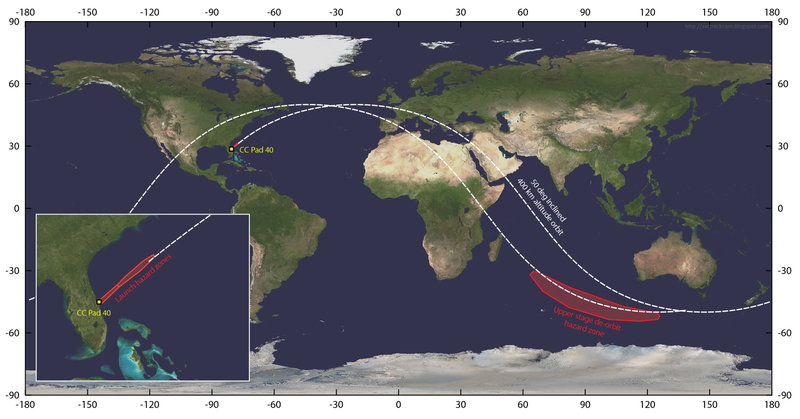 This means launch into the orbital plane of USA 276 has become viable, as the latter's orbital plane passes over the launch site near 3:38 UT on January the 8th, only minutes after the end of the launch window. Note that for the original January 5 launch date, this was not possible. This would seem to suggest that the coincidence in time of the launch window and orbital plane passages in November was indeed coincidence (but there is a "but": see below...). 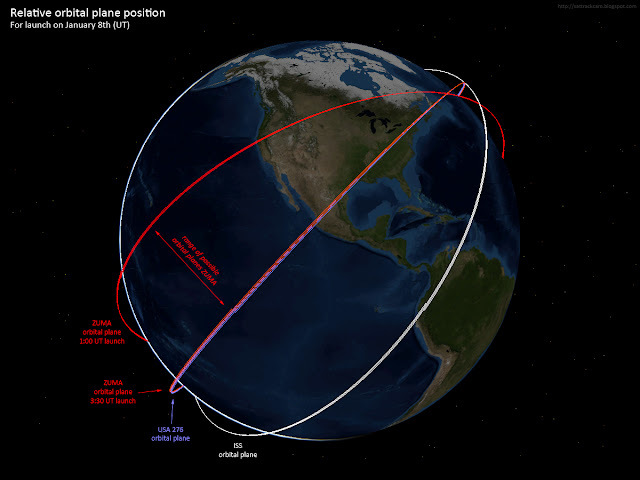 On January 6th, the orbital plane of USA 276 passes over the launch site around 4:27 UT, an hour after the end of the launch window. The orbital plane of the ISS passes over the launch site around 7:04 UT, some 3.5 hours after the end of the launch window. The launch already has slipped three days, and a few days more delay would slip the passage of the USA 276 orbital plane increasingly forward into the launch window, as the moment of orbital plane passage shifts about 24 minutes earlier in time each day. And a further delay eventually would do the same for the ISS orbital plane passage after several more days. The official reason given for the delays of the past few days is "extreme" weather (strong high altitude winds). This might well be true, but there is always a possibility that the delays are a ruse to obfuscate (if that is the case) that the orbital plane of USA 276 is the actual target (there are historic precedents for such a ruse). That however remains speculation (emphasis), and it could well be that the actual launch time, when it happens, will be off from the moment the orbital plane of USA 276 is passed. We will see. There is therefore very little to say with certainty about the possible function of ZUMA. But ZUMA is likely a technology demonstrator, i.e. an experimental satellite to show that a particular technology is feasible, as we also pressume USA 276 to be. I could (again) speculate that perhaps ZUMA and USA 276 are part of the same experimental program. As these two spacecraft were built by two different companies (Northrop-Grumman and Ball Aerospace), perhaps they are technology demonstrators in competition for a follow-up contract. But this is pure speculation. Many options are open. Exactly how (if at all) the two satellites are related to each other remains murky. Maybe future orbital behaviour will shed some light on what ZUMA is doing. UPDATE 9 January 2018: a follow up is here, with spectacular images of a fuel vent by the Falcon 9 Upper Stage. UPDATE 11 Jan: a second follow-up post reflecting my changed thinking on what Zuma could be now we know it targetted a ~900-1000 km orbit, is here.